Investigators believe a fire that devastated a garage in Hampshire, causing thousands of pounds in damage and destroying more than 20 cars, was sparked by an electrical fault. The blaze at Williams Garage in Otterbourne near Winchester took more than 40 firefighters three hours to control. They had to remove tanks of fuel, propane and butane gas from the premises to stop them from exploding. Fire is a rare occurrence at garages but it’s vital that your motor trade insurance policy properly covers your business for fire damage. The fire in Otterbourne broke out at the end of last month and investigators from Hampshire Fire and Rescue Service have spent more than a week probing the probable causes of the blaze. They initially thought the fire could have been started deliberately but they now believe it was the result of an electrical problem. 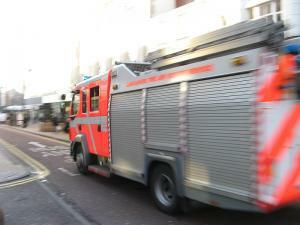 It’s thought the fire broke out in a corner of the garage near an area used for paintwork. In addition to the thousands of pounds worth of damage caused to the building, the flames destroyed a number of cars. They included a Ford Sierra Cosworth RS500, which was one of just 500 ever made. It was worth an estimated £60,000. The family-owned business also lost tools stored overnight in the main building that was virtually destroyed by the fire. An adjoining workshop and offices were also badly damaged.